Every school is blessed with a core of special teachers who are the catalysts for the good that goes on within its walls. Some of these special teachers even reach legendary status. Our alma mater, Cathedral High School, recently last one of its legends. 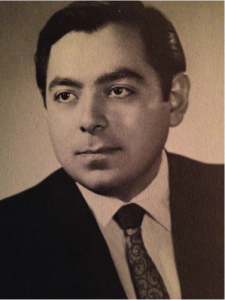 Raul Guereca passed away on January 12, 2016, and was recently memorialized by hundreds of friends, former colleagues, and most appropriately by former students and their parents. What follows is a personal recollection that I hope will evoke in others memories as fond and enduring as the ones I cherish. …Imagine trying to control a choir of over 70 sleep-deprived, hormone-filled, multi-aged boys five days a week! An obvious, but perplexing, question is this: How did Mr. G get so many to join choir? If he had a special plan, no one but him knew it. Indeed, the allure of singing in the Cathedral choir still remains a bit of a mystery. Why would a teenage boy choose to attend 7:15 a.m. rehearsals three days a week after a long night of studying, with a day of classes and perhaps hours of after-school sports practice still to come? The answer, quite simply, lies completely in the person of Mr. G Through a sixth sense of what teenage boys- dozens of them in one place at the same time – needed and should be allowed to have, G made choir fun and engaging. He let boys be boys, but kept them focused; he let them laugh with and at each other, but challenged them; he knew when to rebuke and when to reward. He knew that deep down we wanted to reach our potential as a choir, and we knew deep down that we didn’t want to disappoint him. In this dual knowledge lay the essence of a leadership that produced excellence. …Cathedral is, and for ninety-one years has been, a school characterized by the hope and possibility necessary to educate young men. In the faces of boys who couldn’t act and in the voices of boys who couldn’t sing, the humble, hardworking and hopeful Mr. G unceasingly saw and heard possibility. In his own imitable way he turned boys into men, and it can be argued that no other teacher in the school’s history touched as many young lives for as many years as Mr. G. His music lives on in our hearts. He lives on in our hearts. He always will.